experienced CPR trained nanny available! Hi there my name is Lex! 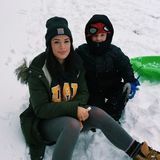 I have 5 years experience as a paid babysitter with children of all ages! This previous summer I worked as a full time nanny for a wonderful family! I also was a part-time nanny for an amazing family who lived on a farm, so I have experience with outdoor activities! I am very outgoing, trust worthy and caring! I volunteered over the summer for Paths 2 learning, (Therapeutic Horseback Riding For Disabled Children) so I have a lot of experience with children who have disabilities who just need a little extra help. I have experience with transport to and from extracurriculars, teaching numbers, letters, and colors, and children's crafting. Further, I am comfortable working with sick children. I have experience as a caregiver. Also have my CPR, First Aid, and WHIMS certifications. Send me a message via this website and I'll reply within 1-2 hours!